Between the 8th and 13th century, the village developed along the cliff side. This section is made up of houses sheltering the tradesmen and their families. Life revolved around fishing, raising animals, growing vegetables and further construction of the village. The river was vital to village life. It provided foot and water as well as offering protection. Access to the village was possible by steps chiseled into the rock as well as wooden steps. There were ladders down to the boats. These made it possible to fish salmon and trout as well as allowing delivery of wood cut from the surrounding forest. Later, the boats became more important and became known in the Perigord as ‘Gabarres’. These allowed for transportation between villages of large quantities of stone for the Chateaux, wood and leather and all other sorts of merchandise. Commerce developed between the villages along the river. The development of the troglodyte villages and cities allowed the people to develop socially. 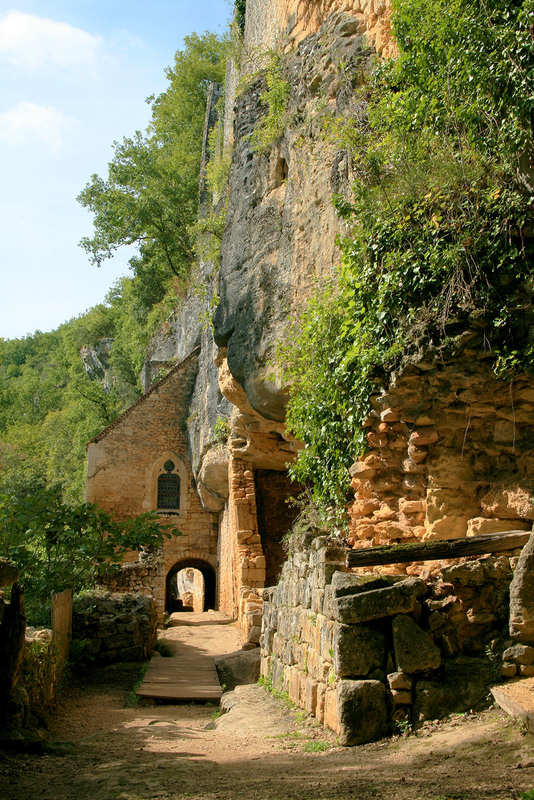 The narrow cliff-side road allowed passage for only one person at a time for defensive purposes. Along the stone road-bed guttering was cut to allow running water and sewage (both human and animal) to drain away into the river. Also round holes chipped out for supporting vertical joists to hold up a canopy for protection from bad weather and arrows.